The Year 7 Netball Team came 2nd place for the whole 2018-19 league, winning silver medals. After their 1st place victory at the Level 2 BSG Dance Competition a few weeks previous, the GDA KS3 Dance Team competed at the finals on Monday 25th March 2019. The competition took place at The Birmingham Hippodrome where the students competed against all of the other 1st place teams from around Birmingham. The students were judged by 3 professional dancers/dance artists based upon a variety of criteria including choreography, engagement and presentation. "As a team, we were really pleased with the judges comments as they were all positive. As an improvement for future performances, we know that as a team we should have been sharper and had more eye contact with the audience. However, regardless of our own critique, we came 2nd place in the whole of Birmingham!! I'm so happy for our team, we worked really hard for this victory within the 2 months we had of intense rehearsals. Personally, my favourite part of our dance was the last song performed to Stefflon Don's '16 shots'." The girls were awarded silver medals for their performance and are now ranked 2nd place in Birmingham for Sport Birmingham's 'Birmingham School Games Dance'. They have exceeded their position and title of last year where they came 3rd place with bronze medals at this level. Well done, ladies! You were fantastic! "After winning the Level 2 competition, we competed at the Birmingham Hippodrome in the Level 3 Competition. It was a good experience and we have learned a lot from the judge's critique for next year's competitions. My favourite part of the day was performing in front of the other schools, as we got to showcase the performance that we have worked hard on for the past few weeks." "This was my first match playing for GDA; I really enjoyed it and worked well with my team. We had excellent spatial awareness and never allowed the other team to retrieve the ball. Between now and our next match we are going to work upon slowing our game down." "We played away at King Edwards Handsworth today and despite the score, we played well. We were told at the end of our match from the other team's teacher that we were playing at "club level" from the standard of our passing, which made us as a team feel accomplished. We challenged the other team, which again was an achievement, and every match is a learning opportunity and a chance to improve our knowledge of the game." On 7th February, George Dixon Academy hosted the BSG Level 2 Dance Competition 2018-19. Opening and judging the competition was professional dancer and teacher Curtis Stanley who has performed for the likes of Mary J Blige, Krept & Konan, Sean Paul and many more. 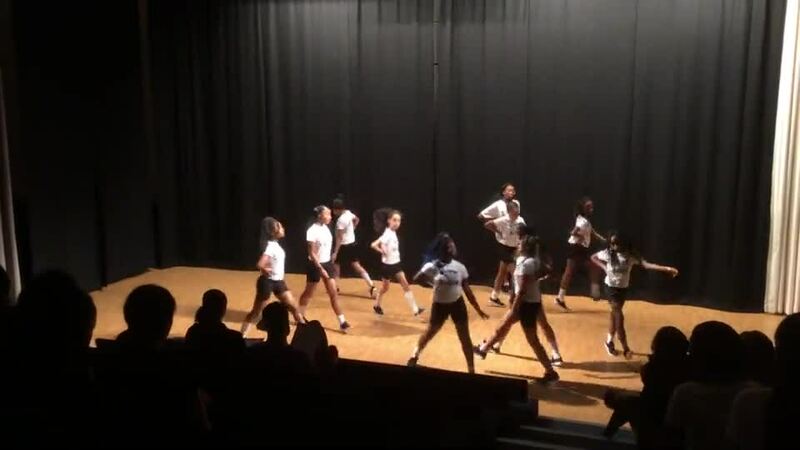 "We participated in a dancing competition and we all really enjoyed it. We have been practising for so long and we worked hard to win this competition. We auditioned for the team back in October and have worked hard since then. The best thing about being in the team was that we had learned lots of new techniques and movements to make us better performers. My favourite part of the competition was the comments we received from the dance because it showed us that we had done a good job. My other favourite part was of course winning gold medals... because we came first place! As a team we really enjoyed the experience and we want to thank our amazing dance teacher and her creative mind." Congratulations to the KS3 team who for the 2nd year in a row have came 1st place in the Level 2 Dance Competition and have qualified for the Level 3's, taking place at the Birmingham Hippodrome! "We auditioned back in October and have been rehearsing since then for this competition. For 3 of us, it was the second time we had entered this competition however this year we were in the KS4 category. We were really successful in that we came 1st place for our partnership and will go forward to the Level 3 at the Hippodrome. Out of the whole competition, we enjoyed performing the most as it was our chance to show off our hard work. We were fortunate enough to have a professional dancer judge us and perform for us also." Congratulations to the KS4 team also for coming 1st place in the Level 2 Dance Competition and have qualified for the Level 3's, taking place at the Birmingham Hippodrome! "We played 4 minute quarters in our game against AMA. During the first 8 minutes, we had scored 4 goals and had scored the remaining 4 goals in the last 2 quarters... This was due to the excellent shooting from our 'Goal Attack' and 'Goal Shooter' Kimya and Oumu. Myself, Haleema and Lacaylah were in defending positions with Colleen assisting in attacking and Mariah as Centre. Overall, our game was great and due to teamwork we didn't allow our opponents to score any goals." "Me and my team played very skillfully and because of this, we won our match! We also won due to good defending skills and our shooters (Alana and Sabreen) were very good also. We performed well throughout the game and everybody got a chance to play at some point. Our player of the match played in the Goal Attack position and had a tough job marking her opponent but still managed to play a big part in helping us win as a team!" "Me and my fellow team mates played skillyfully and were aware of the spaces we were allowed in for our positions. A downfall about the way we performed was that we was not marking our players properly, sometimes letting them free. Our defense was very good as our Goal Keeper played very well. It was overall a good game; everyone was on task and playing at their best ability, although we could have marked the other teams Goal Attack better. I believe I performed well as Centre by being in an attack and defense role. I also played as Goal Attack... I am not normally in a shooting position but I gave it a go anyway. Next time we should mark our players more , so we are now going to concentrate on practicing that and we will hopefully see an improvement in our next game." "On Thursday, me and my team played in an 'away' netball match against Holte. We played 4 five minute quarters. In our first quarter, we scored 2 goals and in our 2nd quarter we scored a further 2. However, in our 3rd quarter we didn't score anything. But in our final 5 minutes we scored 1 more goal, leaving the score at 5-0 to GDA! Me and my team were very strong at throwing and receiving the ball, but we need to work on our close distance passes because when we tried to throw it closely to each other the other team kept intercepting it." "On Wednesday, me and my athletics team had a competition at Hamstead Hall. There were different activities we had to take part in such as: relay, obstacle course, long jump and other events. My team were very strong at the running events but weaker in the jumping events. We now know that because of this we need to improve upon our skills needed for jumping as well as throwing. We also need to practice passing the batons during relay races. Even though we haven't had any practice though since our last competition, we still managed to come 1st place!" "At the athletics competition, I believe we all performed great and showed great teamwork! During the relay race, we did really well and ran at a good pace... because of this we came first in that particular event! Everyone in the team participated in at least one event and did fairly well. The challenge for us as a team was using the rebound board as this put us off slightly and seemed to slow us down sometimes." The year 8 team will now progress to the Level 3 Birmingham School Games Indoor Athletics competition for the 2nd year in a row! GDA played one of several fixtures today in the Birmingham School Games Level 2 Netball Competition. "During the 1st quarter, we were making silly mistakes, playing too fast and not marking our players... this led to the result ending at this point as a draw (1-1). During the 2nd and 3rd quarters we rectified this though and started playing better as a team by communicating with each other. This increased our confidence! The 4th quarter was similar to the 1st with us making silly mistakes and being messy. However, we won our match and are now going to train hard in preparation for our next!" New for 2018-19 at GDA is Trampolining Club! These Key Stage 3 girls have been learning new skills and training weekly to achieve the 10 Awards, each skillfully harder than the last. Here they are receiving Awards 1 and 2! Well done girls! "We played really well as a team in this game. The skill that we portrayed in the best light was our passing. Not all of our shooting was on target and so this, along with our communication, is something that we are going to work upon for future matches." Well done to the Year 9 Basketball team, a fantastic victory! Due to their previous hard work and victories, the GDA Year 8 football team have finished 4th place overall in the cup! "On 7th March we played a semi-final math against Handsworth Grammar School. Unfortunately, lost our match but it has given us lots of things to work upon now in our training. Our defending is one of the things we are going to work upon as opposed to following the ball. We are also going to work upon our formations as a team. However, overall I think we did a great job. Sico scored our 2 goals and was awarded 'man of the match' as well." "I believe that most of our losses were due to the lack of communication during the tournament, so that is what we are going to improve upon in our training now for future matches. I believe we played quite well, however, especially in the game against Aston Manor Academy when we were consistently able to drive the ball down the court." "In the first half, we weren't playing to the best of our ability and there wasn't much communication between the players. However, we played much better the 2nd half of the game as we had then substituted players to keep the energy up; we had good passes with clearer attempted shots. We unfortunately lost this match, but we played well as a team." "We had great fun at the football match against Turves Green Boys School. Our defenders were solid for the duration of the game. We won because our defenders would clear the ball to our midfielders and they crossed it to the strikers to score. We wish we could've kept on playing because we had so much fun and we wanted to score more goals! We are now in the semi-finals and are hoping to win the cup!" Congratulations to the whole Year 8 team! "We played against Eden Boys and because of our hard work and dedication we won another match, this time the score was 6-0! We played better the 2nd half because we improved our teamwork skills. Our goals were scored by players such as Sico and Sean." Adnan, Matin, Tayyub, Mohammed, Mendel, Ousman, Andrei and Suleman. "The ESFA Under 12, is a National 5-a-side competition for school children in Year 7, attracting over 1,000 boys’ teams and 600 girls’ teams from schools across England. GDA were winners of the Aston Erdington & Saltley Schools competition back in December. They progressed into the regional competition, after five games in pool B, the boys finished runners up, which meant they had to play the winner of Pool A. GDA were out played, and out classed by a team of Academy players, losing 5.0 to Sandwell Academy. Overall they finished third in the competition, which is a remarkable achievement." "In the first game of the Year 7 5-a-side tournament GDA played Thomas Telford in the group stage. GDA started off strong but Thomas Telford got through and scored the first goal of the game. Soon after they scored another 2 goals. The match ended 3-0 to Thomas Telford. In the second game everything turned around and GDA scored 2 goals in the first few minutes. But Hagley quickly responded with a goal. However, GDA came back with 3 more goals, winning the game 5-1! GDA got another win, this time against Bewdley, destroying them 6-1. GDA started slowly, but thing soon picked up and we bombarded the other team with goals. In the last group stage game GDA played Priory. GDA carried on their role, dropping goals everywhere and winning that game 5-1. In the semi final, GDA played Sandwell Academy. GDA held their own but unfortunately Sandwell got through and scored 4 goals to do so. However, towards the end GDA did get one consolation goal." "We all did well in both halves of the match with everybody doing a fantastic job. Fred scored a free kick, Sico scored 2 goals, Abulrahman scored 2 goals and Usman scored 1 goal. To improve for future matches, I think our defense needs to be stronger and more focused." "We went to Hamstead Hall and took part in an athletics competition. I competed in the long distance race and a throwing event, where others in the team competed in other events such as the high jump, long jump and obstacle course. The last race in particular was interesting as a member of the team slipped which meant we came in 4th position. However, he competition was really fun and exciting! We were so happy to see the GDA Year 8 team come first place for the Year 8 competition, and we were excited to come 2nd place with silver medals!" "In the athletics competition at Hamstead Hall, the whole team did well. Altogether I think all of us did well in all of the events that we competed in. Also, I don't think that anyone messed up in any of the races they did. Overall, we all did a great job!" The year 8 team will now progress to the Level 3 Birmingham School Games Indoor Athletics competition! Adnan Satar Janua, Mohammed Ihtishaam, Ousman Diaby, Mendel Quansah, Matin Zkria, Muhammad Suleman, Wisdom Ibhadon, Hakeem Banye, Daniel Djalo. "On a bitterly cold Wednesday evening nine Yr7 boys took part in a 5 aside competition which was held at Aston Manor School. GDA played Bishop Walsh in their first game, it was a fairly an even game with both teams battling for every ball. GDA scored first and they began to dominate the game. In quick concession GDA scored their second goal and they continued to challenge for every ball. Bishop Walsh pulled a goal back and the game ended 2-1." GDA were drawn against Handsworth Grammar school in the final of the 5 aside Cup competition. Both teams had skillful and very quick players, both showing good possession of the ball. GDA’s goalkeeper Adnan played a massive part by saving every ball fired at him. Mendel and Ousman out classed the opposition with their skill level and speed on and off the ball. Suleman run for every ball and had many shots stopped. Mohammed controlled the defense, his work rate improved with every game. The whole team played with passion and a desire to win. The final whistle was blown; GDA boys did themselves proud by winning 1-0. Having been crowned champions, GDA have been invited to take part in the English Schools 5 a-side competition in the New Year.” A Fantastic Achievement”, well done to all the boys!